Using Map My Social is very easy! These instructions will show you how! Basically there are two main things you can do – add/edit/remove your own Social Munzee or capture someone else’s Social Munzee. We’ll explain these functions below in more detail. Once on the Print page, look at the Barcode Value section, and you will see the full barcode URL of your Social Munzee. All you need is the LAST 6 DIGITS (before the last slash). This is your Social Code. It will be something like: XC3F3Z. Standard – adds your Social Munzee to the map. A marker will be added next to your Social Munzee image that is available from a fairly wide zoom (up to a view of about 1200km). Hidden – adds your Social Munzee to the map, however, a marker will NOT be added next to your Social Munzee image. This means that the only thing showing on the map is your Social Munzee image. If you want finding your Social Munzee to be a bit of a hide and seek game, then this is the one you choose! Note that Hidden Social Munzees will only show up on the map when you zoom in to a view of about 10km wide! Make sure that your social image does NOT include the QR code (otherwise people can just see it if they visit the munzee URL online). 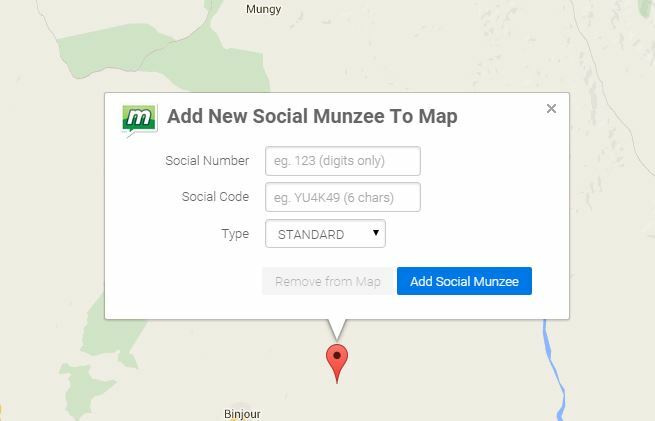 By making your Social secure (by purchasing the Secure Social add-on from Munzee.com), you can make sure your Social only gets captured once on the map! You can then go and update the secret code on the Map My Social map if you want it found again! World View – adds your Social Munzee to the map with a marker that is viewable from ANY zoom level. This makes your Social Munzee very easy to find for anyone that zooms out in the map – great if you want lots of captures on your Social! Note that this type is currently only available by request in special circumstances. Once you have chosen the type and filled in the Social Number and Social Code, click the Add Social Munzee button to add your Social Munzee. Don’t worry if you haven’t chosen an image yet for your Social Munzee on Munzee.com. We will create a QR code and display it on the map for you. If you add an image later, you just need to “Edit”, then “Save Changes” to pick up the new image. You can edit either the Social Code (which you may have entered wrongly, or you want to change it because it is a secure social), or the Type of social (either standard or hidden). You cannot modify the Social Number – if you need to modify this, then you should add a new Social Munzee on the map. You can also move your Social Munzee by dragging the marker around on the map – where you drop the marker will be the position of the CENTER OF YOUR SOCIAL IMAGE. When you are ready to submit your changes, click the Save Changes button. 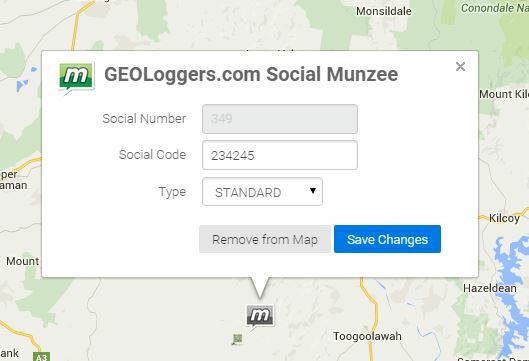 If you have changed your Social Munzee’s title or image (on Munzee.com), you can update these changes on the map by clicking on your own social and then clicking the “Save Changes” button – this will go and get any changes you have made at Munzee.com. From this popup window, you can also Remove your Social Munzee from the map completely. To do this, simply click the Remove from Map button. You can always re-add your Social Munzee later if you wish. To capture someone else’s Social Munzee, you will need to search for GREEN markers. Green Markers denote Social Munzees that you have not captured yet. RED markers denote Social Munzees that you have already captured. GREY markers denote Social Munzees that you own. Once you find a Social Munzee on the map (that is not your own! ), you can capture it just like you would any other Social Munzee. Use the Munzee app on your phone to capture the Social Munzee image / QR Code. If the Social Munzee image does not want to scan correctly, click on the image (or the marker), and you will see a Show QR Code button. Click this to see a generated version of the Social Munzee QR Code which you can scan. If you cannot scan a particular Munzee, you can click the Mark as Unscannable button. This will put a mark on this Social (in the Map My Social App) to specify someone has not been able to scan it.